TVWeek reports that "NBC is teaming up with self-help guru Tony Robbins and Biggest Loser producer Reveille for a reality show that aims to radically transform the lives of participants--in most cases without surgery, million-dollar prizes or drill sergeant-like personal trainers. The series does not yet have a title, but will reportedly feature the self-help guru and sometime fire-walker coaching people on ways that they can change their lives in a period of uncertainty. I don't think I know anyone who likes Tony Robbins' schtick less than I do, but the timing on this series appears to be perfect. 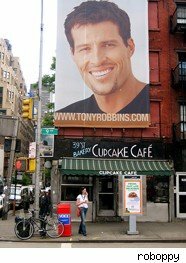 Robbins' brand of motivational mumbo-jumbo and life-changing "Unleash the Power Within" rhetoric, this "Peak Performance Coach" seems likely to score a hit -- a Donald Trump for down on their luck apprentices. The main reason this show seems likely to work is that Robbins has essentially built his career on personal magnetism and charisma. Watch the video below to hear Robbins describe one of his greatest accomplishments.